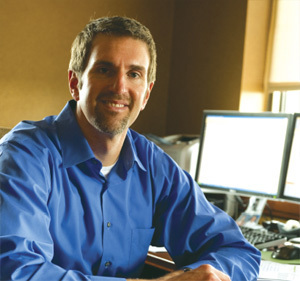 Jeff Lautt, Executive Vice President of Corporate Operations at POET, is known for his steady leadership and nerves of steel – traits that are essential in managing and growing the nation’s largest ethanol company. Serving as a volunteer firefighter in a small South Dakota town and as a top executive in the nation’s largest ethanol company may seem as different as two jobs can get. But Jeff Lautt, POET’s Executive Vice President of Corporate Operations and a former eight-year volunteer firefighter in Dell Rapids, S.D., is living proof that the skills and talents needed to succeed in the two wildly divergent endeavors are actually surprisingly similar. Lautt brings the same intensity, passion, and sense of meaning to running a cutting-edge, rapidly-growing ethanol company as he did to saving lives. And the same traits that made Lautt successful in fighting fires, performing water rescues, and extricating passengers from trapped vehicles – nerves of steel, grace under pressure, stellar judgment, and a belief in the virtue of the work he’s doing – were what catapulted the thirty-something Lautt to a professional role in which he manages POET’s daily operations and growth, including the work of over 1,400 team members in 26 ethanol plants. “It’s been a wild, fun ride,” says Lautt, noting that POET has tripled in size in the four years he’s been at POET. Lautt left a position as President of Brandon, S.D.-based fire truck manufacturer Crimson Fire (where, not surprisingly, his interest in becoming a volunteer firefighter was first sparked), to take on the role of POET’s Chief Operating Officer. Lautt didn’t take lightly the decision to leave Crimson, where he had spent 14 years, starting out as a design engineer and eventually being promoted all the way to President while he was still in his twenties. But when Lautt met with POET Chief Executive Officer Jeff Broin for the first time, he felt a “chemistry” with Broin and knew they had similar ideas and approaches to thinking about business and relating to people. He was also excited about moving to “a larger company that was going to create some larger challenges for me.” Lautt took the plunge into the ethanol industry and – like any great firefighter or top corporate executive – has never looked back or second-guessed his decision. “Jeff can handle a high volume of work, and nothing seems to get him rattled,” POET CEO, Broin says. “He has a good sense of humor and tries to keep things light even in difficult situations.” Lautt has succeeded at a relatively young age and earned the respect of his colleagues and because “he is charismatic yet humble,” Broin says. Lautt’s transition from fire trucks to ethanol was eye-opening. He immediately recognized that he’d get his share of adrenaline fixes working in an industry that is highly scrutinized by politicians, the public, and the media because of its close ties to energy and agriculture policy – and its potential to change the world. With the ethanol industry at times being anointed the “savior for everything” and at times suffering negative publicity (the very week Lautt went to work for POET, an article in the Wall Street Journal asked “Is the future of the ethanol industry looking grim?”), Lautt had to quickly develop a thick skin and a passion for educating the uninformed about the industry. “I always say ‘If you can make it from a barrel of oil, you can make it from a kernel of corn.’ I not only believe it, but it’s actually true,” Lautt chuckles. Those barrels of oil and those kernels of corn – precious commodities that experience their share of ups and downs in the world market – are constantly at the top of Lautt’s mind. “You have to have a stomach for volatility. This business is not meant for the faint of heart,” Lautt says, noting that a drought in Argentina can affect corn prices in the U.S., or that the threat of war in an oil-producing country can cause a vicious market reaction. A year and a half after Lautt was hired as Chief Operating Officer at POET, he was promoted to his current position as Executive Vice President of Corporate Operations. Currently, Lautt is in charge of all commercial business units, including design and construction, plant operations, marketing, logistics, and risk management. Lautt is also responsible for POET’s business development and human resources. The business is in good hands, says James Moe, Chief Operating Officer of Design & Construction and Plant Management for POET. Lautt’s “ability to gather and digest the data, as well as balance interpretation of issues and information” make him a strong leader. “Where do we go next?” and “How do we constantly raise the bar and get better?” are questions Lautt constantly asks himself, and he revels in pondering – and creating – the answers. “I like growth. I like growing companies. This company and this industry have grown faster than I ever expected they would,” he says. Pretty good news for an adrenaline-junkie with firefighting in his veins.